Fred Fanning was one of a number of livery stable operators in San Diego County in the late 19th and early 20th centuries. By the time of this ad, automobiles were coming into American life, but horse-based transportation was still an essential element. The ad also offers some historical perspective on transportation terminology, then and now. Note, for example, how Mr. Fanning’s selling points include “Fine Rigs, Good Teams, Careful Drivers.” I’ve been fascinated to see how the term “driver” was used, in pre-automotive days, to describe someone who drove a team of horses. While an individual might “ride” a single horse, he or she “drove” a team of horses. That tells you something about travel time in the days of original horsepower too! 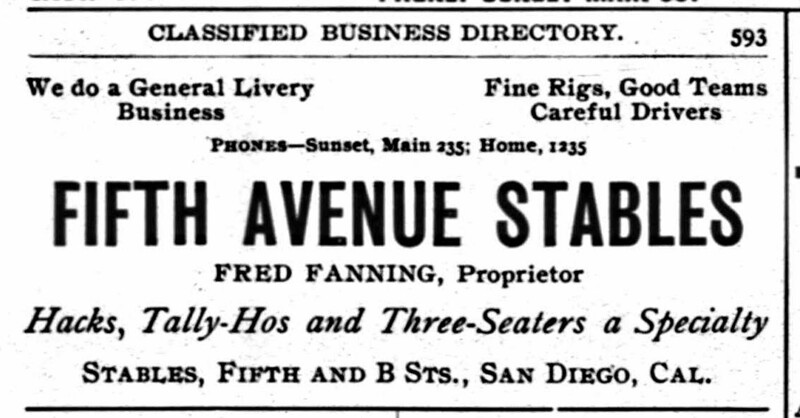 Back to Mr. Fanning’s ad, you can also see the evolution of vehicle terminology in the phrase: “Hacks, Tally-Hos and Three-Seaters a Specialty.” I would venture to guess that if Fanning had an auto showroom today he would be offering vans, high performance sports cars and coupes.